We own our exclusive safari hunting area and hold legal concessions on over 800,000 acres of New Zealand's most unique and untouched country. These areas are above and beyond some of the best in the world – and only priviliged few will ever have the opportunity to hunt such exclusive territories. Our continued addition of free range hunting grounds enables us our ongoing committment to maximising the hunters' opportunities for success. This committment helps to ensure that trophy quality continues to improve. 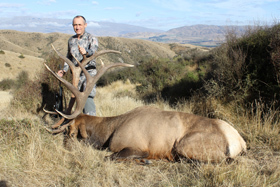 New Zealand Trophy Hunting offers its clients superb hunting for all South Pacific game species. 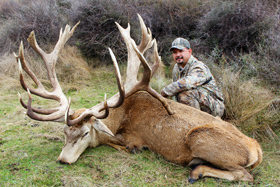 In our Hunter Hills you will hunt on thousands of acres of rolling to steep tussock grass and brush country that is the home to the majestic red stag, wapiti, fallow deer, whitetail deer, wild goats, arapawa rams and wallaby. 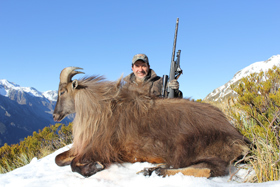 Our Southern Alpine mountains rise to over 12,000 feet above sea level and it is in this mountainous region that we hunt our alpine game species, alpine chamois and himalayan tahr. We also arrange hunts on game species located in the North Island, Australia and New Caledonia. We offer many accommodation options, fine cuisine, wines and hospitality, professional guides, comfortable modern vehicles, and the best possible quality of trophy animals. You can be assured of gold medal service every step of the way. Our team of expert guides with vast local knowledge allow us to create an adventure which will immerse you in the very best of everything our country has to offer. Let us show you the experience of a lifetime.